When it comes to an exhibition stand a display board might not be your first thought but these versatile and lightweight display stands can work really well at exhibitions, particularly if you are on a very tight budget. Here are a few reasons why you might consider display boards for your next event. Display boards can be used for a whole host of events and display needs. They are ideal for displaying marketing information about your business at exhibitions. They can also be used to display images of your product portfolio – saving you space on taking lots of physical products to a show. Other uses include craft fairs, tourist information centres, art exhibitions and schools. Local community groups, such as historical societies, use display boards for exhibiting information, and photographers can use them to showcase images in their portfolio. 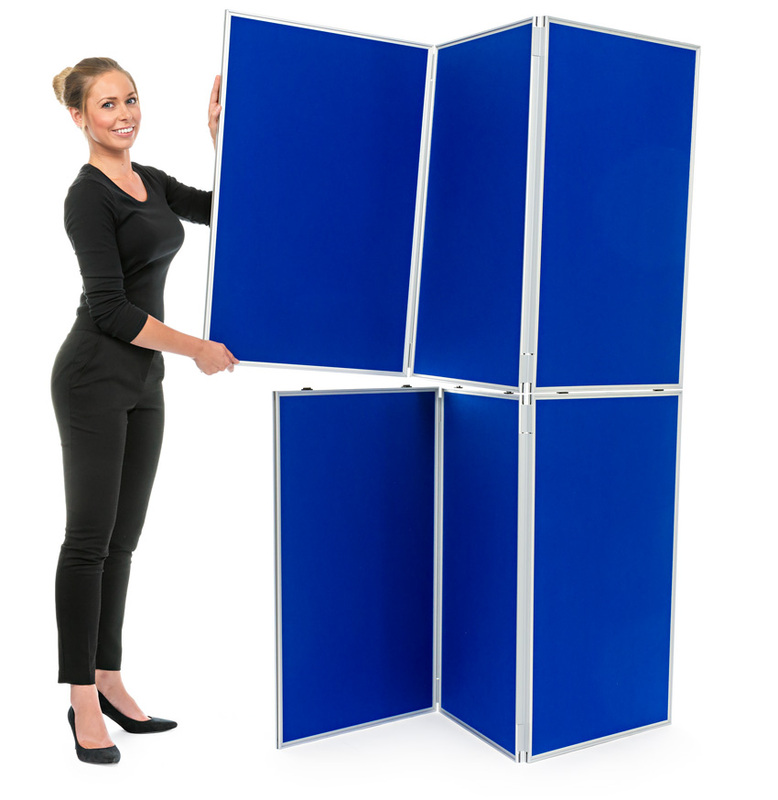 Our range of display boards offers great variety so there is bound to be a display board to suit your needs. 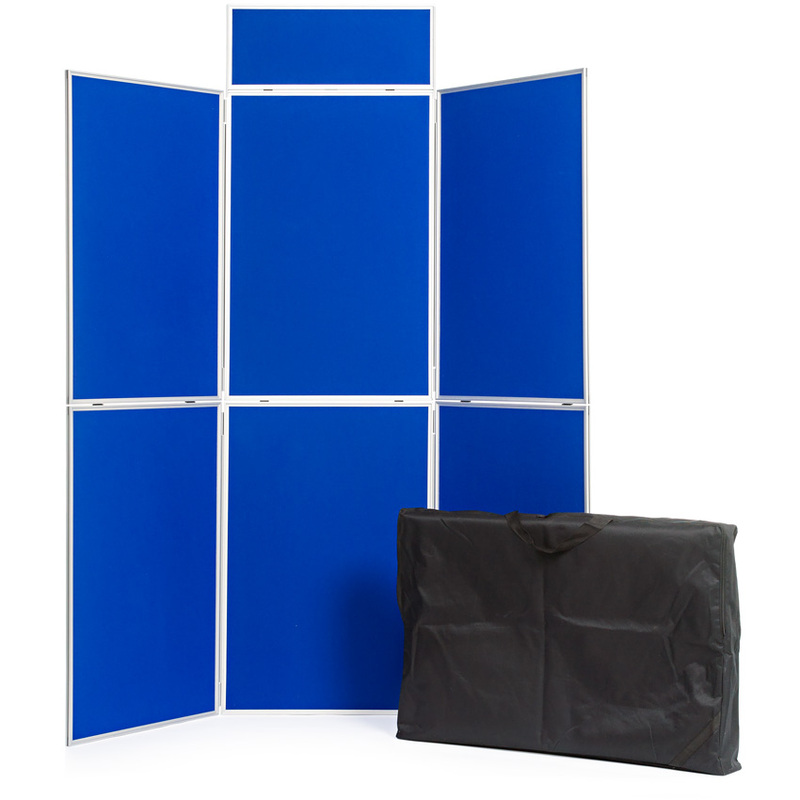 Our folding display boards are available with either a PVC frame or aluminium frame. They come in a choice of configurations including table top displays, 6 panel, 7 panel with integral display shelf and 8 panel. Folding display boards are the easiest to use. Our panel and pole display boards are exactly what they say – display panels and poles which fit together to create a display stand. Choose from aluminium or PVC frame and with 4, 6, 8 or 10 display panels. Panels can be fixed in landscape or portrait orientation and can be set up in various configurations depending on space. Poles can be angled to create curved, zig-zag or straight displays. The heavy duty display boards follow the same principle as folding display boards but have a unique aluminium frame with gear edge hinging. This makes the boards more robust and suitable for a more permanent display. Choose to have plain fabric or printed graphic panels. We also offer larger display boards, such as our Jumbo Display Boards and Concertina Screens. As well as display these can also be used as room dividers or office screens. Display boards truly are a lightweight display option. Our junior table top display board weighs just 3.5kgs and our best-selling 6 panel folding display board weighs just over 9kgs – easily manageable for one person. Each display board comes with a specially designed carry bag which will hold all the elements of the kit. This makes it easy to carry and transport by car or on public transport. The bag will also protect the display board when in transit or storage. Display boards offer a blank canvas. They are covered on both sides with plain fabric so what you display is entirely up to you – from printed posters to art prints, greetings cards to photographs. As your display materials are not permanent it is easy to change the information on show at low cost without purchasing a whole new stand. This is ideal if you change your marketing messages regularly. Call us on 01733 511030 to find out about our printed poster options for display boards. The display boards are double sided so you have a large display area to use to promote your business. One side of the display board has a recess within the frame so that graphics can stay in place even when the display board is folded – great for easy set up and take down on a busy event day. To bring more focus onto your display board why not add a spotlight? This clips easily into the top of the frame and can be used to illuminate your stand. With prices starting at just £52 for a table top display board, these stands are great value for money. If you are on a very limited budget you can get a quality displays and still have money left for printed display materials or accessories for your stand. Most of our display boards are folding ones so the panels are hinged together and simply unfold. For six, seven and eight-panel boards the top and bottom sections unfold and then simply click together to assemble the stand. No tools are required to assemble folding display boards and set up can be done by one person in minutes. 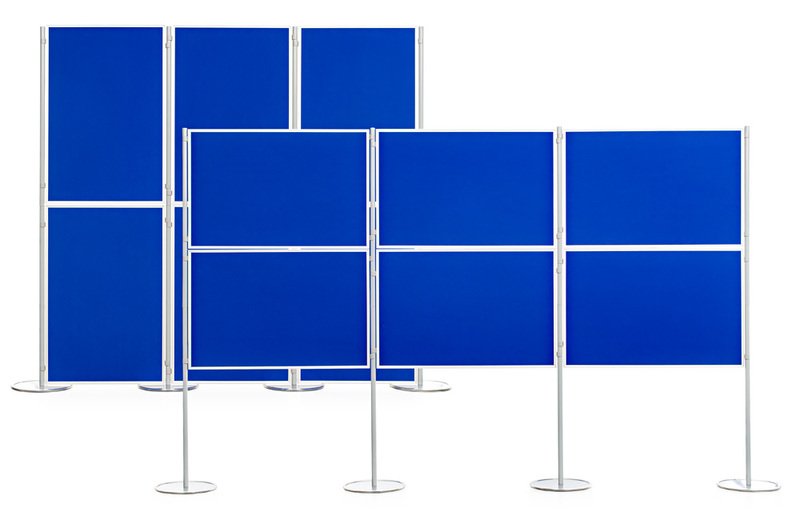 The Panel and Pole display boards come as a set and include clips which attach the display panels to the poles. The panels can be attached anywhere along the pole and set at various angles to create a display unique to your needs. All of our display boards are freestanding so can be used anywhere – ideal if you attend a range of events in different types of venues. All or display boards are covered both sides with luxury foam backed loop nylon fabric. There are 13 colours to choose from so you can find one to suit your business. Display materials and posters can be attached to this fabric using Velcro so it is quick and easy to set up your display board and attach your marketing materials. We offer a wide range of accessories which can sit alongside your display board to enhance your stand. For example, add a literature holder for marketing materials or company brochures; or a promotional counter as a meet and greet point on your stand. You could have an iPad stand to add an interactive element to your display – visitors can browse your website on an iPad to see what else you have to offer. Another option with display boards is a printed tablecloth which can be printed with your logo. These are especially popular if you are using a table top display board as it gives your display a professional finish. For more information on our display boards or any advice for your next event or exhibition, please contact us or call 01733 511030. At XL Displays we are experts in exhibition stand design and portable display equipment.